Just wanted to point out that there is a recording on the web of the opera Silent Night by Kevin Puts. During the pre-performance lecture some cast members were still rehearsing the battle scene. Just want to add a quick note that I thoroughly enjoyed yesterday's matinee performance of the opera Silent Night. I attended the pre-performance lecture, which was helpful, as it filled in a lot of details of the plot that I had missed when watching the movie. But it was the performance itself that really grabbed me. The opera opens with a prologue set in an opera house in Germany where a performance of a Mozartian opera is in progress. As if to let the audience know that, yes, this is a 21st century work, the orchestra begins with a mild dissonance before segueing into a devilishly clever pastiche of a Mozart work. Silent Night Curtain Calls. I had a reasonably good view from the Amphitheater, though there were a number of intimate scenes on the far stage right that I couldn't see. The score by Kevin Puts is accessible on a first hearing and is filled with other pastiches of a Schubert lied and both German and Scottish folk songs, but it was the orchestral interludes that I found especially appealing. The cast is wonderful and gives a solid performance, and they obviously know their roles as most of them have performed them about a year and a half ago in Minnesota. The staging is nothing short of magnificent, certainly the best opera staging that I've ever seen here in Philadelphia. The battle scene in particular was riveting. Three more performances. Highly recommended. I'm thinking of going back for seconds. It's Christmas! How About a Little Truce? Prince Charles? Would you go to war if he were assassinated? Suppose Prince Charles of the UK were assassinated while he was traveling in South Korea. Would you consider that a justification for the US going to war with, say, Japan? And yet in essence that's what precipitated the First World War, or The Great War, as it was called. Archduke Ferdinand of Austria and his wife were shot dead in Sarajevo, and because of a series of treaties binding various countries to fight for each other, Europeans suddenly found themselves at war with each other in August 1914. Yes, it was a bit more complicated than that; there were long-simmering rivalries and feuds among the various nations, etc., etc. Given the precipitating event, the killing of a prince whom no one really liked, it was necessary for the propaganda machines of the warring nations to flip into high gear, whipping up the populations into a frenzy of irrational hatred for the "enemy". 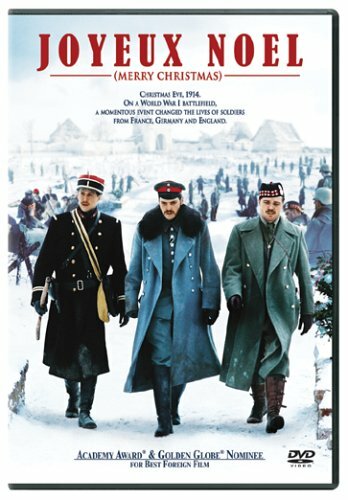 And so it came to pass that on Christmas Eve, 1914, during a lull in the fighting, with German troops on one side of the trench and French and British troops on the other, the soldiers heard their "enemies" singing Christmas carols across the divide. An informal "truce" was declared and the "enemy" factions joined together to sing carols, trade cigarettes and booze, and discover the common humanity that they all shared. Alas, it doesn't have a happy ending. The next day, the troops were reluctant to fight against their new-found "friends", and so each side began to warn the other of when a surprise shelling was about to occur. Needless to say, once the generals found out about the "truce", they were not amused. There was going to be hell to pay, and they exacted their own form of punishment on the "disobedient" troops. As I said, that's a true story, and it formed the basis of one of my favorite movies of the last few years, 2006's Joyeux Noel (that's French for "Merry Christmas"). And now it's been turned into an opera, Silent Night with a libretto (based directly on the movie's screenplay) by Mark Campbell and music by Kevin Puts; it was the winner of the 2012 Pulitzer Prize for music. Originally staged by the Minnesota Opera in 2011, it has now come to Opera Philadelphia. I'm going to see this afternoon's performance, and I have to say, I haven't been this excited about a new musical work since, oh, since Stephen Sondheim's Passion nearly 20 years ago.